In The Night of the Rabbit, you play as Jeremy Hazelnut, apprentice magician, who has only two days of summer left until school starts! After quick chores assigned by his mother, which not coincidentally serve as a tutorial, he’s off with his hat, wand, and coin to let his imagination run wild in the woods behind his home. 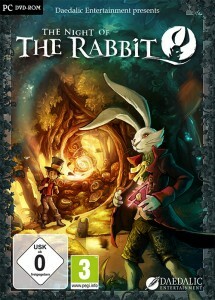 His imagination becomes reality when he runs into the Marquis de Hoto, the dapper rabbit on the cover, who introduces Jerry to real magic and a fantasy world. Every bit of The Night of the Rabbit‘s presentation comes together and evokes a child’s storybook brought to life. The dialog of each character, from the kindly master magician to the rude, thieving leprechaun, is solid and believably delivered. The music is well done and, while no track serves as a stand out, it complements the storybook visuals nicely. Graphically, the game is gorgeous. While the animations are a bit stiff, the environments are all hand drawn with bright, vibrant colors, and everything just pops. In fact, they pop so much that the pixel hunting the adventure genre is famous for can be very difficult. The hand drawn characters and backgrounds are beautiful. And here, Daedalic Entertainment made a smart design decision. Early in The Night of the Rabbit, Jerry’s special coin becomes enchanted so that when he holds it to his eye, magical objects become highlighted with a wispy glow. Mechanically, this allows the player to hold the middle mouse button in order to light up all the hot spots on the screen. One of the adventure genre’s major faults is the often difficult pixel hunting, and this magical coin allows the player to decide just how hard or easy they want the collection portion of the game to be with no penalty. The game also includes a day/night cycle – partway through the game, Jerry receives a book that can turn day to night and vice versa. Characters appear in different places depending on time of day, and some characters and items may only be accessible during certain times. This creates even more opportunities for pixel hunting, so the coin becomes a welcome addition. This single frame has at least thirteen points of interaction. The coin is essential. 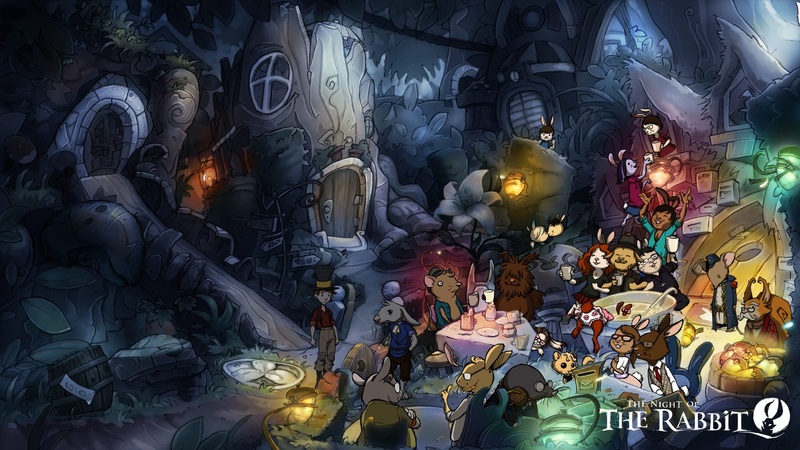 As a point and click adventure game, your time in The Night of the Rabbit that isn’t spent searching the environment for objects that can be used is instead taken up by manipulating the objects in your inventory. Objects in your inventory can be examined and used on objects in the environment, and some can be combined with others in your inventory. One early puzzle has Jerry mixing five items in his inventory before using them on the environment together, for instance. Like many games in the adventure genre’s past, the solutions to puzzles range from totally sensible, to becoming stuck and randomly clicking items hoping something works. For example, the aforementioned puzzle is repeated later in the game, but with completely different items that don’t match the originals in the slightest, leading to an extreme amount of frustration. Nonsensical puzzles have been a problem in the adventure game genre but recent entries, particularly The Walking Dead, have made significant improvements. 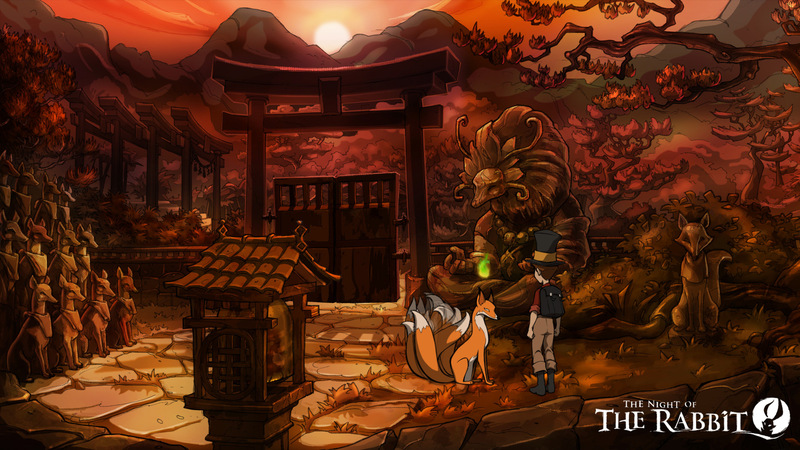 Daedalic attempted to alleviate this shortfall as well by including a hint system. Jerry can ask for advice from characters in the game through use of his magic wand, but that advice is rarely useful. Jerry travels to some very different locations, leaving the art fresh throughout the game. On top of The Night of the Rabbit‘s frustrating gameplay mechanics, the plot is also full of rough edges. The story tries to be as charming as its art, and many of the characters are endearing. 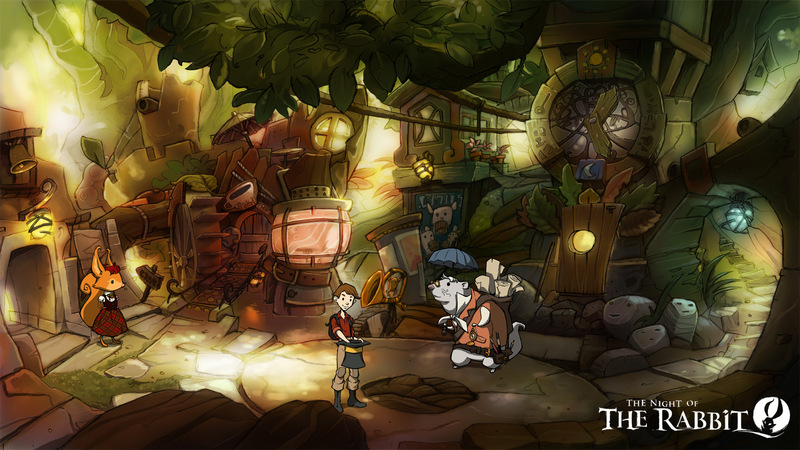 As you continue through the game, it continues to tease at something deep, adding complexity to the characters’ backgrounds and the history of the alternate world Jerry is exploring. Early questions are only made more mysterious as you continue through the game. Most games in the genre would slowly bleed answers to you while presenting more questions as you solve the puzzles. The Night of the Rabbit, however, rewards you with a five minute info dump in the form of a movie at the very end, attempting to answer all of your questions in a very short period of time. Some foreshadowing is given if the player finds hidden items in the form of dewdrops, but this still leaves the anticlimactic ending a disappointment. Information sprinkled throughout the plot in a bit more of a subtle way would have been welcome. These dewdrops, as well as a series of hidden stickers, allow fans of exploration and collection to get some more time out of The Night of the Rabbit. There is also a mini-game that is introduced called “Quartets.” Basically an adaptation of “Go Fish,” Jerry can challenge any town citizen to a game. If Jerry wins he can earn a special card, another collectible in the game, but there is no story reason to play “Quartets” at all. The game is kind of fun, but absolutely unnecessary to complete the game. If there is one thing that this game proves, it is that Daedalic Entertainment is attempting to improve their craft from their previous adventure games over the years. The Whispered World suffered from too much dialog that was shallow, while Deponia showed improved characterization and a great sense of humor. If you are not a die hard fan of the adventure game genre, this game won’t do anything to change your mind. But if you miss the old days of King’s Quest, Broken Sword, and the SCUMM engine, The Night of the Rabbit is a decent addition to your library that has miles and miles of heart. Expect a game that falls well short of greatness, but still does its best to charm you every step of the way.